Millions of residents from the Midwest to Northeast are bracing for an intense winter storm this weekend that will likely bring heavy snow, sleet, freezing rain and strong winds. Some areas could see over a foot of snow. Over 350 flights were cancelled and more than 2,200 were delayed Friday. Amtrak has also modified service for the weekend. In Pennsylvania, where residents are set to see snow and freezing rain, Gov. Tom Wolf has signed a state of emergency declaration. "We want to be aggressive in managing this storm, during which snowfall rates could exceed one to two inches per hour,” Wolf said in a statement. "If you do not have to travel during the storm, please avoid it." New Jersey Gov. Phil Murphy has also declared a state of emergency, telling reporters the weekend is "a big window with a lot of variability around it." 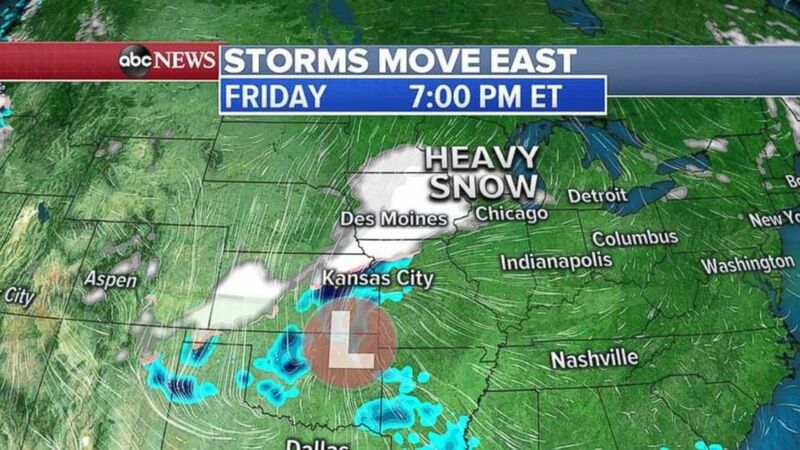 The snow will first hit the Upper Midwest and the Plains on Friday, from Oklahoma to Wisconsin. Friday night into Saturday morning the snow will move through St. Louis, Chicago, Indianapolis and Detroit. Chicago is forecast to get 5 to 9 inches of snow. On Saturday, some areas in the Ohio Valley may see over 6 inches of snow and wind gusts over 35 mph. By Saturday night, the heavy snow will move from Cleveland, across Pennsylvania and into New York City. 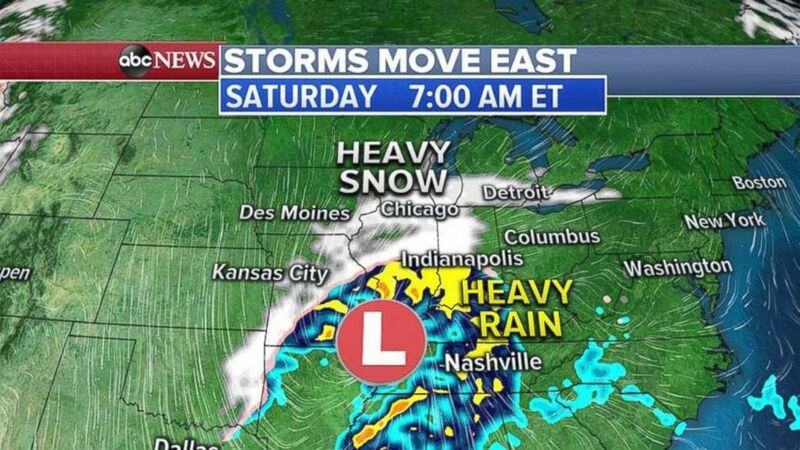 Meanwhile heavy rain is forecast to move east into Washington, D.C, the Carolinas and Virginia. On Sunday morning heavy snow and strong winds will be pummeling northern New England, bringing over 1 foot of snow. 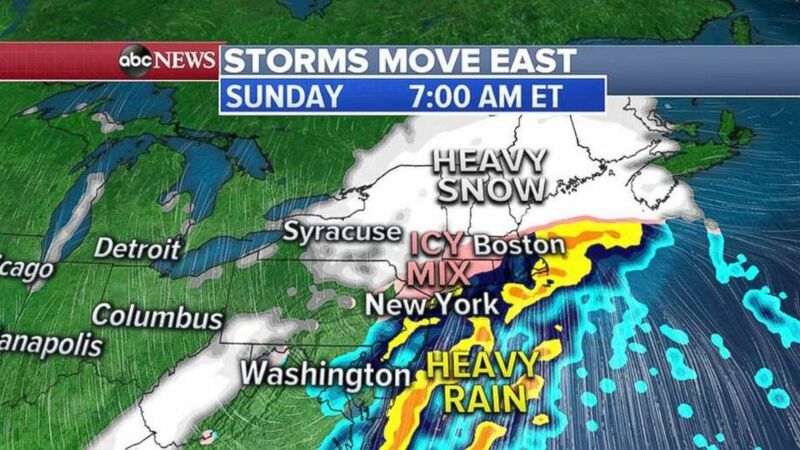 The snow will change to an icy mix of sleet, freezing rain and rain from Boston through New York City and Philadelphia. Icy roads may be a major issue on Sunday for New Jersey, New York City and southern New England. From Ohio to Maine up to 2 foot of snow is expected, with even more in the mountains as heavy snow and strong winds slam northern Pennsylvania, upstate New York and much of northern New England through Sunday afternoon. Boston could see over 6 inches of snow before it faces a wintry mix of sleet and freezing rain. 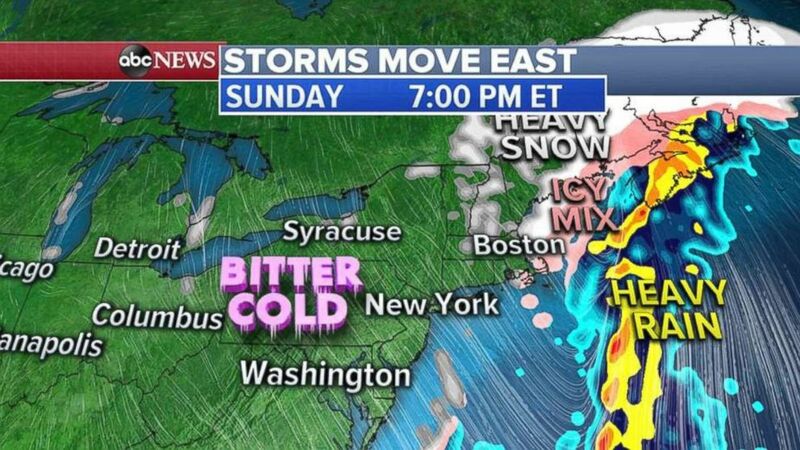 New York City could see 2 to 4 inches of snow before sleet accumulates on top of it. That will be followed by rain or freezing rain, leaving a sloppy mess on the roads by Sunday morning. Philadelphia will see a mix of rain, snow and sleet, with 2 inches at the most. ABC News' Brendan Rand and Christine Theodorou contributed to this report.